It's a wonderful thing to see a jewelry designer who actually knows how to work well with mixed media. While I've seen a number of wire jewelry designers attempt working with wire and fibers, Hill is one of the few that has actually accomplished it successfully. Her jewelry works. And it's appealing and folks would actually wear it unlike much of what's already out there. 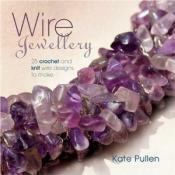 This is a well written and conceived book that includes sections on Wire, Fiber and Felt. Each project has its own detailed instructions, with ample instructions and there are a total of roughly fifteen or so total projects. I found the scarves in this book truly inspiring. You'll get to see Rosemary's real skill as a jewelry designer shine thru in the Felt section. Who knew that you could really, seriously wear felt jewelry without it looking somehow odd? Aside from the detailed individual project instructions, Hill also gives her readers the added bonus of various tips and inspirational ideas throughout the book. You'll also find a general techniques section at the end of the book for additional help. All in all, this book well conceived and thoughtfully prepared, a wonderful inspiration to those of us looking to start making mixed media wire jewelry. 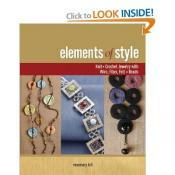 If you knit or crochet and want to apply those skills to making wire jewelry, then this is a solid book for you. Although this isn't a full blown review, I have gone thru this book several times and found it meaty with many designs and variations plus good illustrations and step-by-step photos.
. Great things often come in small packages and this is one of them. 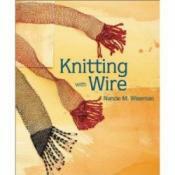 Knitting With Wire by Nancie M. Wiseman is a small packages that's packed with great information and projects for the experienced knitter looking to turn wire art jeweler. 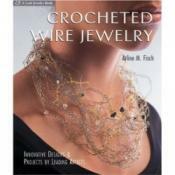 Crocheted Wire Jewelry: Innovative Designs and Projects by Arline Fisch is a book well worth consideration even if you're a seasoned crochet jewelry artist. Ms Fisch lives up to her reputation as a pioneer of woven jewelry by taking an old technique, crocheting, modernizing its’ application for successful wire jewelry.